DragonFable - Design Notes: The Forum of Nieboheim! Last time in the main story, you found your way into an audience with the Magesters of the Shapeless Empire! Although you didn't get any aid for the fight against the Rose, the Magesterium saw fit to allow you to spend more time in their glorious city of Nieboheim, capitol of the Shapeless Empire. And this, week, that's just what you'll be doing! The grand marketplace, The Forum, has been re-opened for foreign and domestic trade. This new area of the city provides many wonders to see and secrets to overhear. The market also brings a new cape and helm to purchase, three new food items, and a special vendor who will sell you extra potions- for a price- and only if you can handle them (If you have a Dragon Amulet, in other words!)! It's time to see what life in Nieboheim is all about! 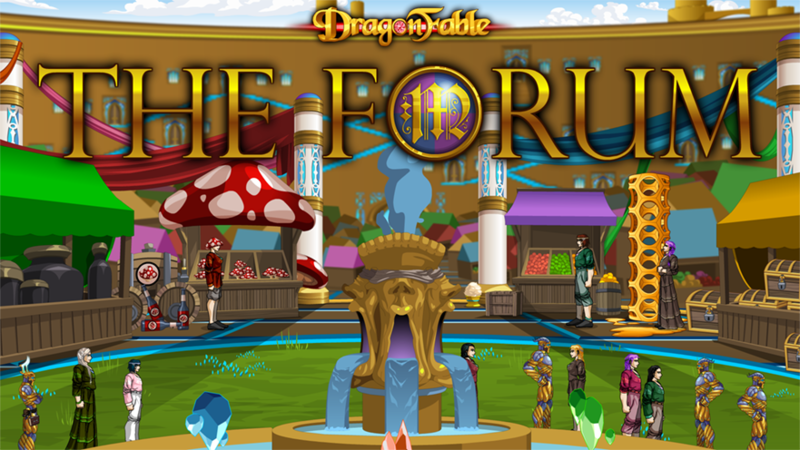 It's time to explore: The Forum! You can reach Nieboheim in Book 3 after progressing through the main story and sailing across the ocean from Swordhaven's Helm's Harbor. Or, if you've already visited Nieboheim, you may access it directly from the Book 3 travel map in the Book of Lore. A variety of issues with ChronoZ armor have been resolved. ChronoZ currently is still unable to select different targets when under the effect of Blink combo. The Time Shop has been added to Cysero's Shop in Book 3 Falconreach. An issue where talking to Cysero's Orb in the far left room of Cysero's Shop would send you across to the pet store has been fixed. Ruby the Adventure Chef in Book 3 Falconreach now sells Moglinberry Juice to Dragon Amulet holders. As of this release, the Firefox browser has an issue where preferences and options cannot be saved. However, they can still be loaded. To work around this issue, you can try setting your options and preferences in another browser, then playing in Firefox. The Artix Games Launcher also should not have this issue. Found anything interesting in The Forum? Have theories about the Shapeless Empire? Have something you'd like to see explored in Nieboheim or about the Magesterium and the Shapeless? Let us know what you think on the official forums! The more feedback and questions we get, the better we know what type of content and story to explore!